As Valentine’s Day approaches, a wise person starts thinking about what gift to give to their loved ones. Chocolate is always a popular gift. And as a homeschooling parent, I try to turn many things into lessons. How could I turn chocolate into a lesson for my children, and how can I get some chocolate out of the deal? The answer became clear: a chocolate tasting survey. As with any good research project, this lesson required some background information. My kids learned about the different types of chocolates, the history of chocolate, how chocolate was made, where the cacao beans grow, and how different countries make chocolate. All of this research led to the question of interest: What type of chocolate is favored by most people? As a statistician, I was really excited by this project (more so than my kids!) because it was going to be their first school project where they could truly apply some statistical methods. Since they already had learned about different types of chocolate, they decided they wanted to compare the taste of these different types: bittersweet chocolate, cocoa powder, dark sweet chocolate, milk chocolate, semisweet chocolate and white chocolate. After explaining the difference between a rating and a ranking, the kids decided that they would have people rate the taste of the chocolates on a 1 to 5 scale rather than ranking. Regardless of the choice between rating and ranking, there can be a downside. As you will see in some of the data in a moment, we definitely had one of those downsides! The rating scale went from 1 for dislike the taste very much up to 5 for like the taste very much. Now how to go about collecting the data? The children decided to ask people in our neighborhood to evaluate the different chocolate types. This essentially determined the population of interest. Although I described the benefits of a random sample, we chose a convenience sample of neighbors since we needed to go into other people’s homes. I did win a small battle for random sampling in that the order of presentation for the chocolates was always random in order to minimize presentation bias. A total of 14 people (eight children and six adults) took part in this survey. Each person was blindfolded and given a small piece of chocolate to taste. Water was available to cleanse the palate between the samples. As mentioned earlier, the kids randomized the order in which they presented the samples. Each panelist was asked to rate the chocolate on the 1 to 5 scale. The kids recorded all of the results. Once they gathered all of the data, the real fun started with JMP. After a quick 15-minute introduction to the software, I turned them loose to create some graphs. I was always available to answer any questions and help them with the fine-tuning of their graphs. I also provided some extra insight on some things to think about when creating the graphs, such as: Do you want to show all of the data or just a summary statistic? How could you show all of the data? Here are some of the graphs that they created. It was great seeing them explore the data in new ways with JMP. They created many graphs they did not understand and some downright ugly ones, but overall I think they did pretty well. 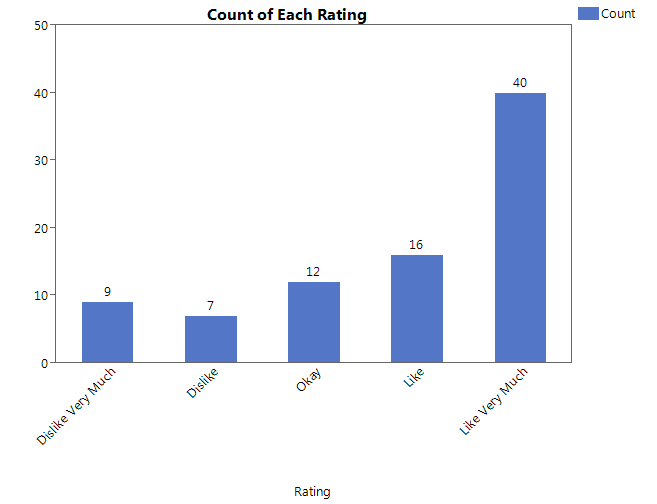 The basic picture showing how often each rating type appeared. With eight of the 14 panelists being children, it is definitely skewed to the “Like Very Much” rating. That is one of the downsides of a rating: It may not differentiate the chocolates very well if the same rating is given to all of the chocolates! 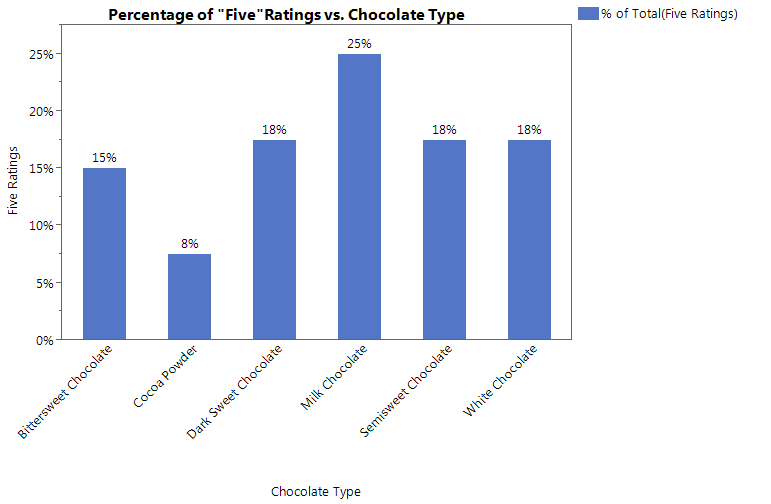 A chart that compares the different types of chocolates by their mean rating. It looks like the milk chocolate is the winner, with cocoa powder being the big loser. My daughter’s attempt to see which type of chocolate got the most 5 ("Like Very Much") ratings. 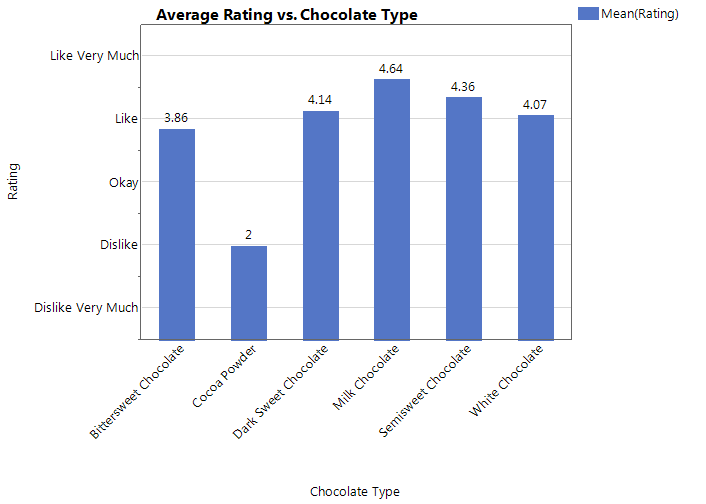 This next picture is an interesting graph to show the average rating for each chocolate type, but also trying to show each rating on a single picture. 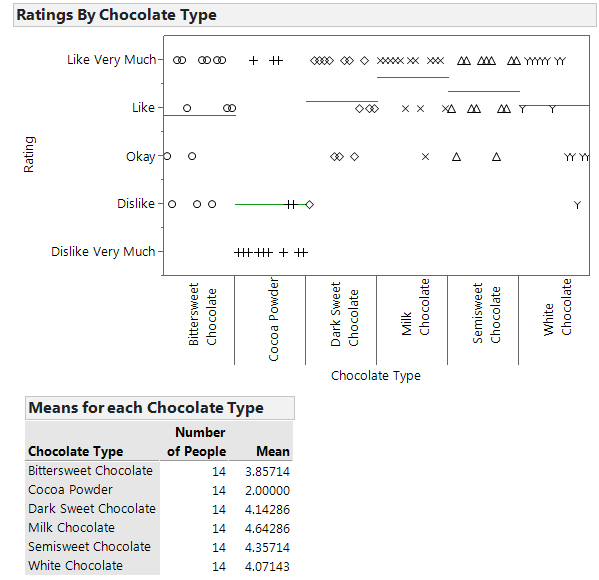 You can clearly see that cocoa powder was the only chocolate type to receive the dreaded “Dislike Very Much” rating. 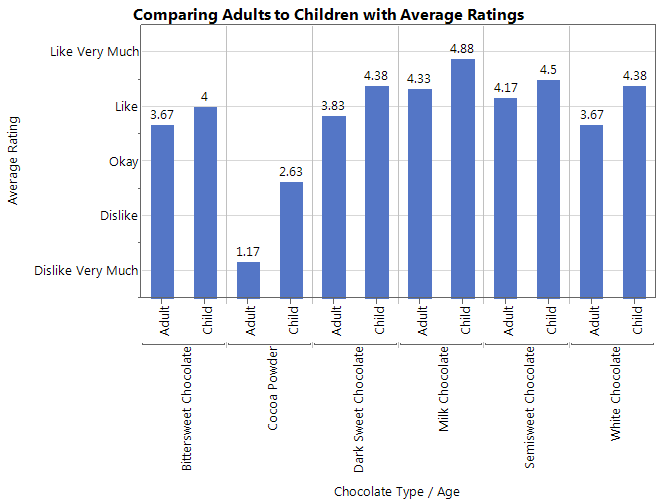 And finally, a graph that my son decided to create that compared the different adults to children for each chocolate type. The picture makes it pretty clear that the children were not quite as picky as the adults as they liked everything better. Give me a set of data, and I just have to start playing with it! This chocolate data was no exception. I really liked the graphs that my kids came up with, but I had to add a statistical twist to one of them. I added the mean diamonds and box plots to a graph. I also really wanted to see if there were any statistically significant differences between the chocolates. 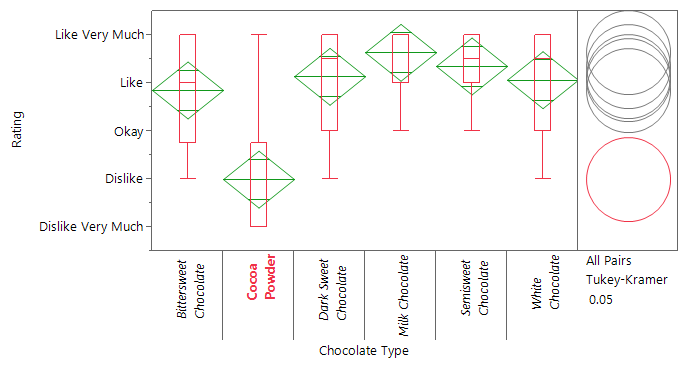 Surprisingly, even with the small sample size, the testing did reveal that the cocoa powder was indeed statistically different from the other chocolate types. This difference is captured beautifully by the comparison circles. It would be good to get some of the nutritional information on the chocolates to see if they relate to the taste ratings...maybe that will be my kids' next lesson.